A Token for Your Thoughts? Got something to say? Deliver your message with a little mystery and a lot of style, the lifetokens way. lifetokens are a new, fun way to send someone a personal message. As the sender, you compose a special message online. Then your recipient is sent a printed token that arrives the old fashioned way, via the U.S. Postal Service. The token lets the recipient know that a message is waiting and provides a unique six-digit code for unlocking the electronic greeting. The suspense builds until the recipient goes online to retrieve the message and find out who sent it. Jamie Gladfelter conceived of lifetokens to combine the ease of online communication with the fun of receiving a physical, sentimental token. [lifetoken team on the right.] As a sender, you can choose the token design that best suits your message, whether it’s to say you’re missing someone special, or you’re sorry, or you’re proud of someone. The token designs complement the printed mailing materials, and the same look and feel greets the recipient online. That attention to detail is one of the reasons two different people — Jules’ son Dane Pieri and prolific Grommet-spotter Julia Elmer — told us about lifetokens. When a traditional greeting card won’t cut it, and you don’t want a special message to get lost in the deluge of e-mail, give lifetokens a try. A little effort can go a long way toward making someone’s day. My name is Jamie Gladfelter and I’ve teamed with Studio of the Month to bring you what I think is a new, exciting, and fun way to express yourself and spread some love: lifetokens. 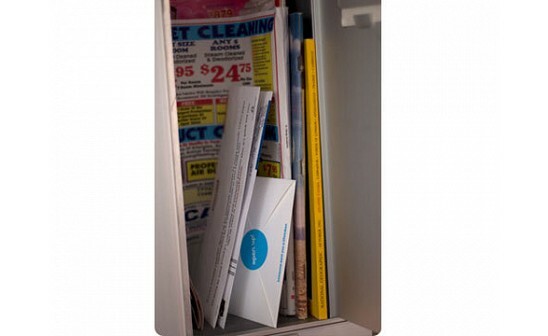 lifetokens combine all the ease of online communication with a real world payoff right in your recipient’s real mailbox! lifetokens make it easy for you to surprise an old friend, thank your mother, or simply say Happy Birthday or Congratulations! The next time you think about sending a greeting card, you might want to consider sending a lifetoken instead! I’d be happy to answer any questions you have about the product. Thanks for taking the time to check it out! 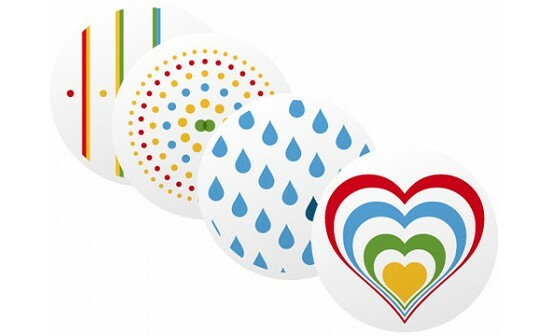 Check out the brand new lifetokens designs for Mother's Day. Here is the one for Mother's Day, very sweet! Most of the Grommets we feature can be purchased directly from us. However, this one is personalized and so clicking on the 'Buy Now' button above will send you to Jamie's site where you can explore and send your lifetoken card. Whose face are you going to bring a smile to today? Thanks Joanne and Katherine! We're excited to be featured amongst all the unique products on Daily Grommet. We hope your readers enjoy our product. We'll be rolling out many more token designs in the future, so check back here often! I remember having an uncle who always carried a special token in with his coins. It had a special meaning to him and he liked to be reminded of it when he fished for his coins. This sounds very similar...a message that a person can tuck in their pocket and be reminded of throughout the day. Chase, a designer over at lifetokens, did a 5 part series at his Studio of the Month blog detailing the process of launching this business. Here's a link to this series if you'd like to learn even more about lifetokens! What are the tokens themselves made out of? Are they durable enough to be carried around as a reminder of the message sent? I love Kate's point about keeping the message with you in your pocket. I received a 'Proud of You' token from my brother the week we finished the project and I have it tucked just inside my desk drawer so I see it everyday. The tokens are wooden and quite durable. We are amazed at how resilient and waterproof the ink is as well. Nothing short of scratching them with a key would mess up the print. Hi, I was redirected to your site as I wanted to order some but when I got there I signed up but then was left with no way to order as I clicked "Open Up" til I was blue and nothing opened. In addition to that it would be nice if before you had to sign up for an email newsletter and set up an account you could get the info for pricing and more details on the homepage then just a map of places you sell. Frankly,I don't care about your map, how many places you have already sold your token or who else bought them and where they live or your little color codes on your map - I want info about your product. 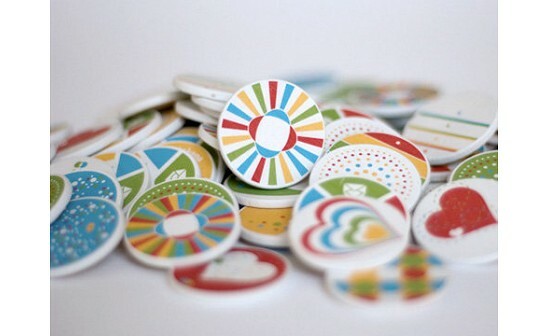 I love Daily Grommet and I would like to have been able to buy the tokens right off their site. I am very busy and I don't have time to go to a site that a company make think is simple but actually wastes my, your possible customers, time and makes me play games just for info. I have clicked every possible thing I could click to get in your site and NOTHING! When I go into my account of nothingness that just had to be ste up it says something like "you have no tokens - open up". GIVE ME SOMETHING TO OPEN UP!!! I would assume this was my issue as I am not really Tech Friendly but since I was able to do everything else on your site but open it for pricing and ordering it seems logical it's your issue and not mine. Any IDEAS??? @Susan: It looks like they've revamped their site since we first featured them. Let me look deeper into this and I will let you know. Thanks! Thanks for your message. Ordering of tokens is temporarily unavailable as we make some changes and improvements to the site and product. If you've signed up for an account you'll be notified as soon as the tokens are again available for purchase. Thank you for your interest in lifetokens. We think you'll really enjoy the new options we have to offer soon (January 2011). Got something to say? Deliver your message with a little mystery and a lot of style, the lifetokens way. lifetokens are a new, fun way to send someone a personal message. As the sender, you compose a special message online. Then your recipient is sent a printed token that arrives the old fashioned way, via the U.S. Postal Service. The token lets the recipient know that a message is waiting and provides a unique six-digit code for unlocking the electronic greeting. The suspense builds until the recipient goes online to retrieve the message and find out who sent it. Jamie Gladfelter conceived of lifetokens to combine the ease of online communication with the fun of receiving a physical, sentimental token. [lifetoken team on the right.] As a sender, you can choose the token design that best suits your message, whether it’s to say you’re missing someone special, or you’re sorry, or you’re proud of someone. 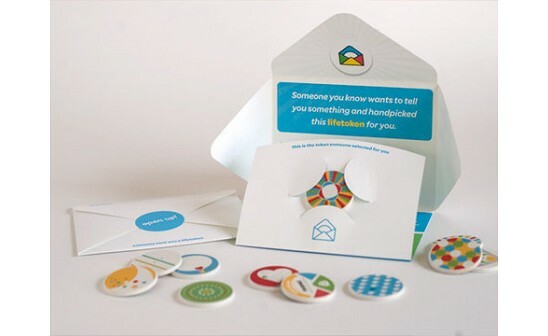 The token designs complement the printed mailing materials, and the same look and feel greets the recipient online.